Central location to learn, discuss and demo all things related to SAP database technology. Topics will be interactive and cover SAP HANA, Sybase, Big Data, Analytics and more. Guests will include high level executives and experts from the SAP community and beyond. Learn how Bosch Siemens Home Appliances Group automated and optimized the screening of high-risk monetary transactions with SAP Fraud Management powered by HANA. Our guest speakers, Franz Bauer, Head of Asset and Invoice Management and Andre Jacubczik, Specialist Corporate Accounting of BSH Bosch and Siemens Home Appliances Group, will share a compelling case study on how they were able to achieve full coverage of payment transactions. Find out how SAP Fraud Management can help fight fraud more effectively and efficiently with faster detection, more accurate investigations and better prevention capabilities in high volume /high risk transactions environments. To stay competitive in a digital, highly mobile, and increasingly collaborative business world, business teams must be able to make the most of the information at hand. This means being able to access, process, and interpret “Big Data” in the moment, generating real-time insights. Learn how you can supercharge your SAP Business Warehouse (BW) data warehouse performance with SAP HANA, an in-memory application, which will radically change how your business accesses important data. Register now to learn how SAP Business Warehouse application on the SAP HANA platform delivers real-time business decisions while simplifying your IT landscape. With SAP HANA, you can do more things that you might not think before. Based on Twitter data, we might be able to find more. Let’s go through this flu prediction example and demonstrate how you can quickly build this type of application on SAP HANA. It will show you the capability of SAP HANA to process the social media data. In this webinar, we invited Sam Bhat, President and CEO, Rohit Patwardhan, GM & VP of Technology, Rahul Joglekar, Chief Architect from United Software Associates to share their experience of how they built an applications on HANA, they will also share how to build similar applicaiton using HANA platform. 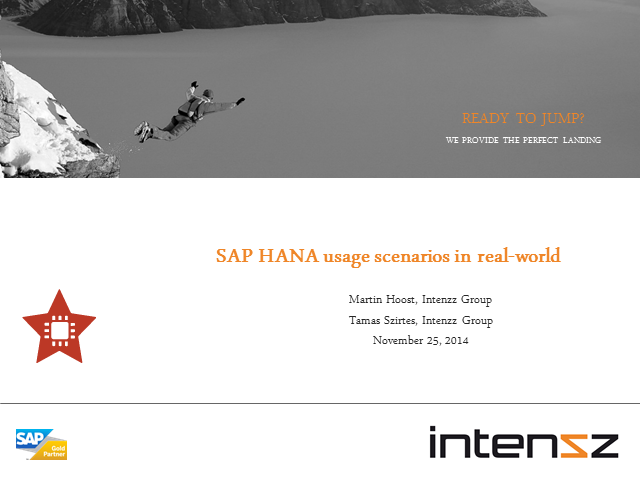 From this example, we will explain how SAP Idea Incubator can support you for application development on SAP HANA. For more information about customer expectations, please visit SAP Idea Incubator website at incubator.saphana.com. Learn about your opportunities for finding more business ideas with SAP Idea Incubator, a unique crowdsourcing community for SAP HANA customers and innovators. Do you have strong data mining background or experience? Do you know there are SAP HANA customer are looking for an application or feature but aren't sure how to accomplish it? Do you know SAP HANA integrates with advanced data mining tools to support comprehensive modeling? You can implement these ideas on SAP HANA by leveraging you data mining knowledge. Customers will review your submission and there might be potential opportunities to complete the idea. You can also build up your profile that lists all successful prototypes you built. Are you are a great inventor of algorithms and approaches for big data, analytics, data mining, machine learning, etc, and are looking for real business problems to solve? Please join in SAP Idea Incubator. In this webinar, we'll introduce you to the features of SAP Idea Incubator, discuss what kind of projects are right for crowd sourcing, the process, and will explore the advanced analytic choices on top of SAP HANA. We cover important considerations such as non-disclosure agreements, handling intellectual property, and sharing of data sets. This webinar is geared towards innovators to help you understand SAP HANA advanced analytics and the perspectives of how to participate into SAP Idea Incubator. Leading edge businesses need complete and trustworthy data to support operational, analytical, and data compliance initiatives. SAP’s Master Data Governance (MDG) solution improves processes, decision- making, and governance with a single, accurate version of the truth. SAP Master Data Governance is focused on centralized authoring and governance in SAP applications, and data distribution to diverse client systems. Offering ready-to-run governance applications with pre-built validation against SAP business logic, master data domains include financial data, material data, supplier data, and customer master data. SAP MDG can be used to govern the specified master data domains or custom built content to deliver consistent data across associated systems. In this webinar, learn how to support your organization's data governance initiatives with a proven packaged solution, find out how to get started, and discover best practices from SAP. With SAP MDG you can deliver trusted information to maximize business efficiency, make smarter decisions, and reduce risk to meet compliance requirements. Many companies have invested heavily in mission-critical business software initiatives. Yet too often these worthy but expensive initiatives fail to deliver anticipated benefits because of poor data. What’s needed is an integrated software solution that improves collaboration between data analysts and data stewards with the tools for understanding and analyzing the trustworthiness of enterprise information. SAP Information Steward software provides continuous insight into the quality of your data, giving you the power to improve the effectiveness of your operational, analytical, and governance initiatives. Register for this webinar today to improve the accuracy and trustworthiness of your organization’s enterprise information. Trustworthy, accurate, and complete data is the driving force of your business’s engine. Yet in the era of “Big Data,” it can be challenging for workers to harness and make sense of all the information at their disposal. With the right data management solutions, you can gain insight across your business where and when you need it and support critical business and decision-making processes. SAP Data Services software helps move, improve, and govern your data, letting you deliver trusted information to all critical business functions. This enterprise-class software enables data integration, data quality, and text data processing in a single integrated solution. Ensure applications work as needed, business processes are uninterrupted, and workers are empowered to make the best decisions. Learn about your opportunities for finding more innovation and business value with SAP Idea Incubator, a unique crowd sourcing community for SAP SANA customers and experts. Do you have an idea for an application or feature you want to build on SAP HANA, but aren't sure how to accomplish it? Or, are you are a great inventor of algorithms and approaches for big data, analytics, data mining, machine learning, etc, and are looking for real business problems to solve? In this quick webinar, we'll introduce you to the features of SAP Idea Incubator, discuss what kind of projects are right for crowd sourcing, and how to submit a project. We cover important considerations such as non disclosure agreements, handling intellectual property, and sharing of data sets. While this webinar is geared towards customers submitting projects, it is valuable for inventors and experts to participate as well so they can understand the perspectives of those who submit projects. This is the third session in our series "Implementing data management strategies for a Big Data-enabled Enterprise Data Warehouse." In this session we will discuss how increasingly, data sources are able to deliver data in real-time. Yet, how do you collect data that is arriving continuously at very high speeds, and in a way that it is most useful? Even more importantly, how can you extract insight from that data and respond as things happen, rather than only being able to respond much later, once you’ve had a chance to analyze the historical data? See how event stream processing adds critical capabilities to your big data architecture.